In general, baking is like a road map. Follow the directions to get to your destination, in this case a baked goodie. I like that baking is precise… most of the time. However, sometimes baking requires a judgment call, which is where I tend to get flustered. I found most homemade pie crust recipes to be vague and subjective and that intimidated me. I assumed it must be difficult and time consuming so I avoided it. I was wrong! I simply lacked the confidence that I could do it, until I met my husband. When I met my husband about seven years ago, he raved about some of his mom’s recipes (and still does because she is an awesome cook), and in this case, specifically her pie crust recipe. At the time I was already an avid baker, but I had never made homemade pie crust or even a pie using store-bought crust. My husband is like me and loves all sweets, but he especially loves pies. You know what this means? Since I love to bake for my hubby I must bake a pie for him. I thought I could ease into the pie making world by using a store-bought pie crust but my husband insisted that I try to make a homemade crust, more specifically his mom’s pie crust recipe. Go big or go home! I asked my mother-in-law for her recipe (she may have gotten it from somewhere but I know it as “her recipe”) and about a bazillion questions to try to get my brain around the vague nature of pie crust. Six years later I’m baking more pies (using homemade pie crust of course) with every passing year and still using her recipe! Pie crusts are a mix of ingredients and technique. Flour, fat, liquid, and getting the amounts of them exactly correct even when it’s cold outside or your kitchen is humid in August. Just having the right ingredients is only part of the trick, and having them does not necessarily mean that you will have a successful outcome. 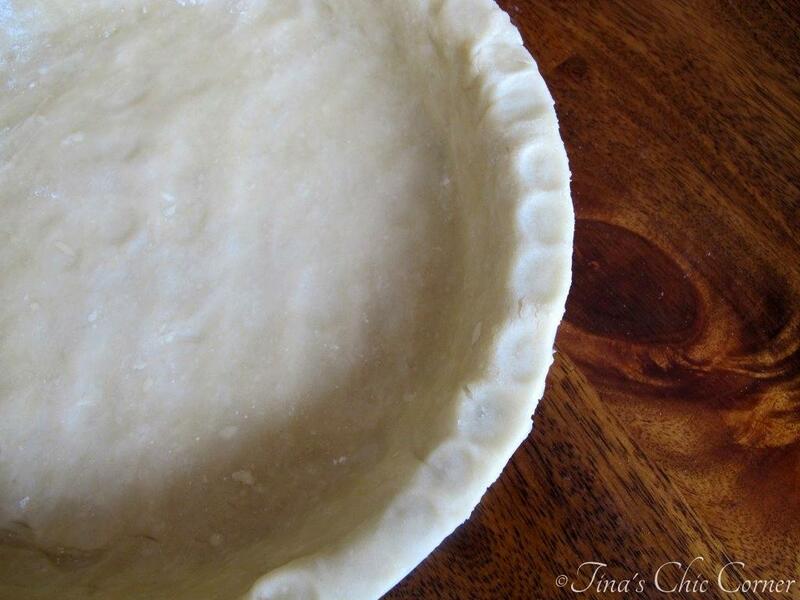 Making homemade pie crust does require some understanding about what you are going for and how to fix it when it’s not quite right yet, but with a few simple techniques it’s surprisingly easy. 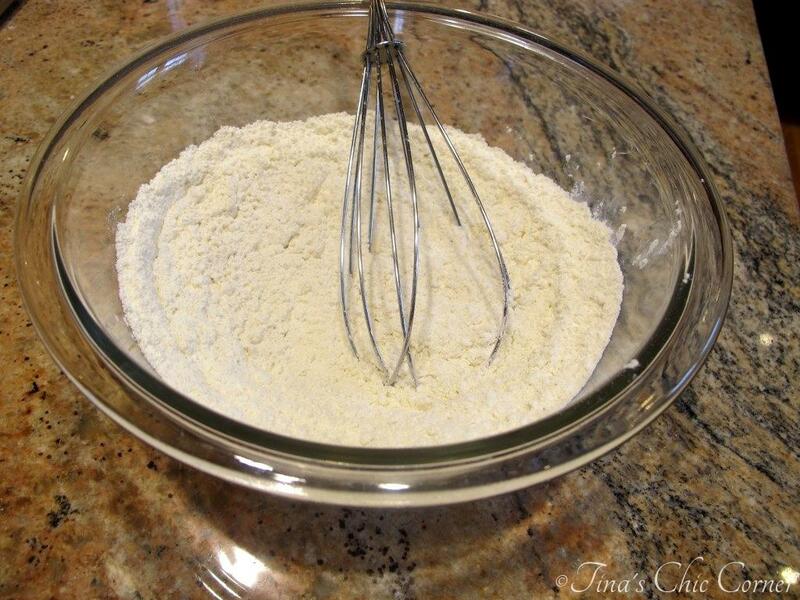 In a medium bowl, whisk together the flour and salt. 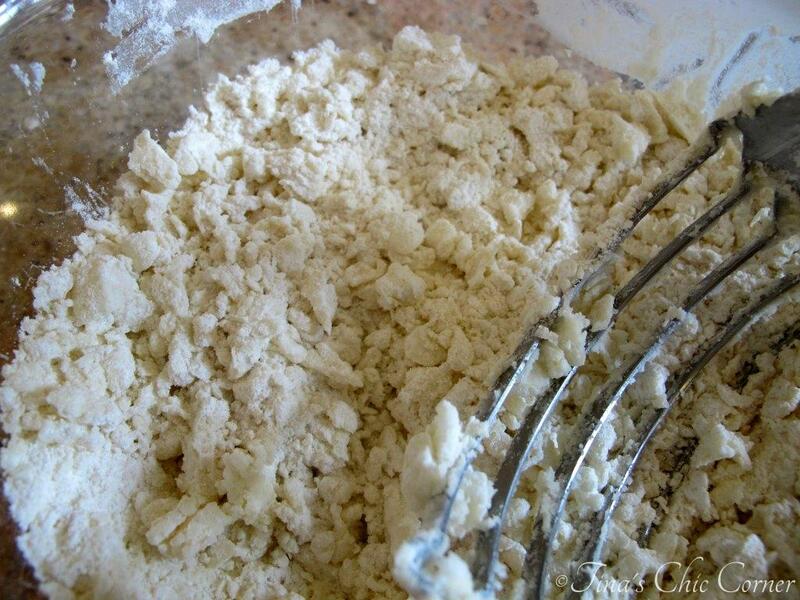 Add the shortening and mix with a pastry blender or fork until the dough is crumbly. Add in 3 tablespoons of very cold water and mix with a fork (not the pastry blender any more if you used it on the previous step) until the dough is moist and comes together. Add more cold water a few drops at a time, if needed. 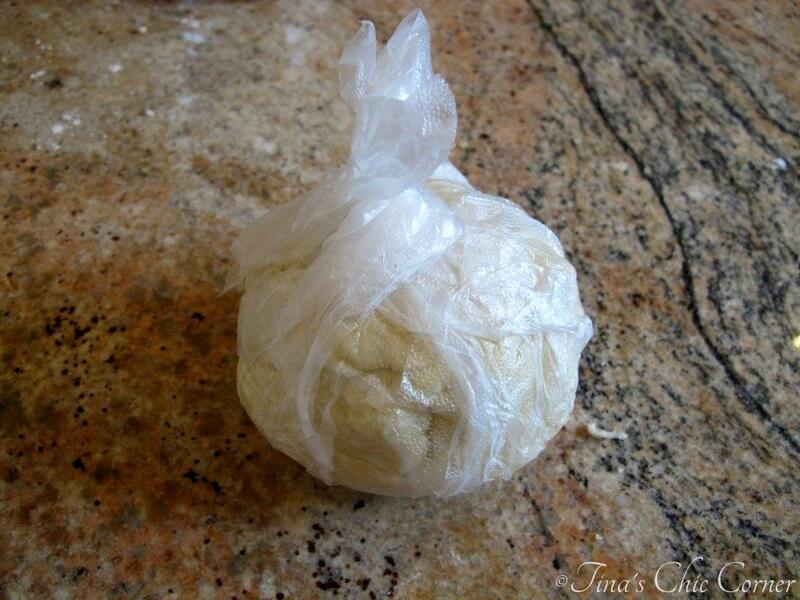 Gather the dough into a ball and wrap in plastic wrap. Chill the dough for at least 30 minutes. Using a rolling pin, start rolling from the center and work your way out. Sprinkle a little flour over the top of the dough and on your rolling pin if the dough is too moist, i.e. it sticks to your rolling pin. Roll out the dough to fit in your size pie plate. For example, today I am using a 10 inch pie plate and I rolled out the dough about 12 inches in diameter to allow for enough dough to go up the sides of the pie plate. Carefully lift the dough off of the surface. Use a spatula to help get it started if it’s a bit sticky. Gently lay the dough into the pan and gently press the dough into the edge of the pan taking care to avoid poking holes in it or tearing it. 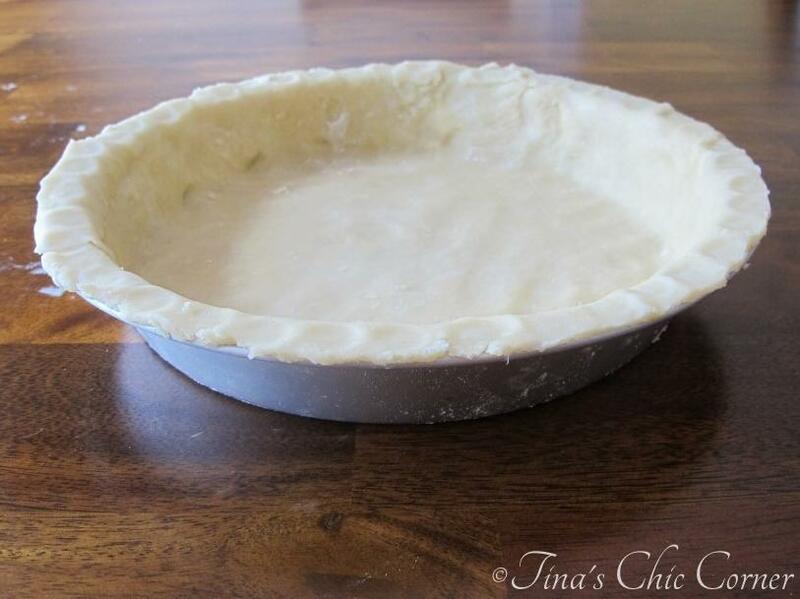 Cut off any excess dough that hangs over the pie plate edge. Poke holes in the crust if the type of pie you are making requires a pre-baked crust. Fill the pie with the desired filling and bake according to the directions of your pie recipe. Flour. Whisk together the flour and salt. 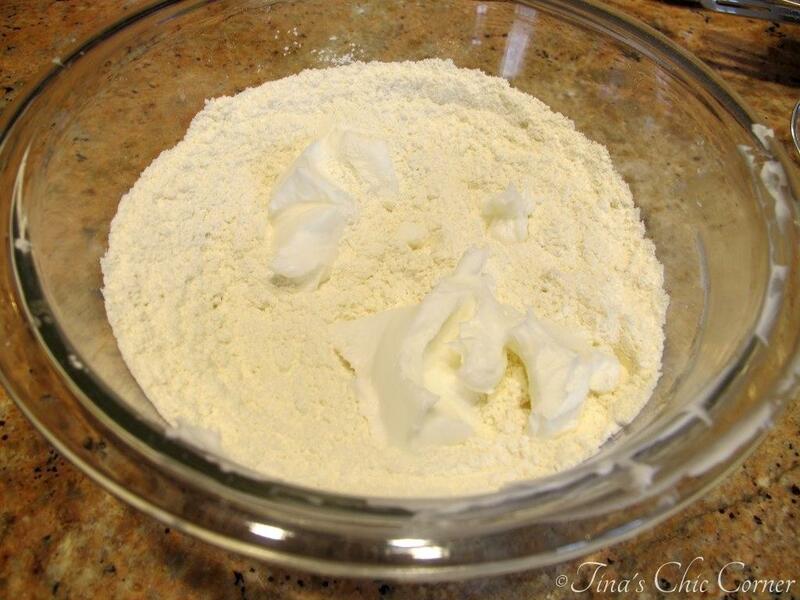 Make sure when measuring flour, you use a spoon to loosely pile the flour into the measuring cup and then level it off with a butter knife. If you dunk the measuring cup right into the flour container you will end up with more flour than a recipe is actually calling for and that could lead to a dried out pie crust. See Baking 101 for this and other fun baking tips. Fat. Do you use butter, shortening, cream, or a some combination of them? There are pros and cons for each option and everyone has their preference. I use 100% shortening. To be honest, I’ve not tried another option so I can’t give you a side by side comparison of what each option offers. I’ve used this recipe for six years and it comes out flaky, tender, and delicious tasting every single time. I don’t have a good reason to look for another recipe when this one gives me a perfect and consistent result each time. The two important things to remember are to use COLD shortening and to mix it until the dough is in crumbly pieces, not combined thoroughly. When the crust is baked, the pieces of shortening and flour will melt into very thin layers, creating a tender and flaky crust. Using a pastry cutter makes it very easy to cut the shorting into the flour. I like to use a good quality pastry blender from Williams-Sonoma. I’ve tried cheaper brands but they were not comfortable. My husband had one that quite literally tore the skin off his knuckles when he tried to use it. If you don’t have a pastry blender then you can use a fork, it’ll just take a little longer. As an aside, a pastry cutter is pretty handy in the kitchen for making things like biscuits or scones. I find it well worth the investment. Liquid. 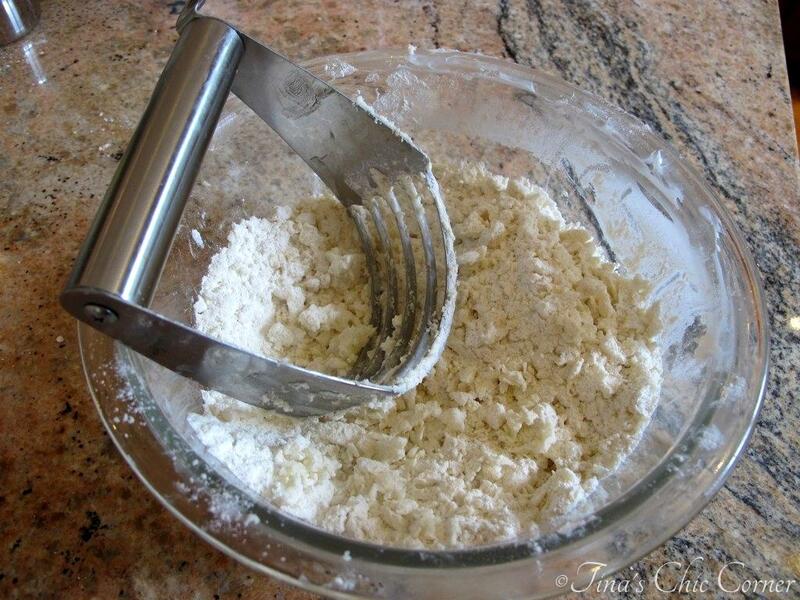 Use very cold water to combine the flour and shortening. Using very cold water will help keep the fat solid. The goal is to use just enough water so that the dough comes together. The dough should be able to stick together if you press the pieces together. It should not fall apart. I start with 3 tablespoons of very cold water, mix, and then add a little bit more at a time until I have the right consistency. 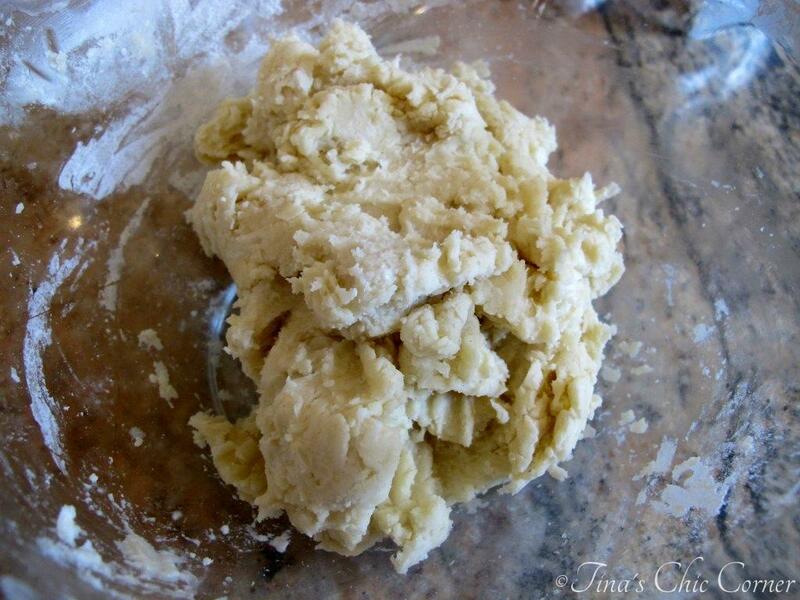 Be careful not to over mix the dough because over mixing may cause the pie crust to be tough. At this point, I like to use a fork to press all of the ingredients together because I feel I can combine the ingredients better with the smallest possible amount of stirring. The amount of water you use will likely vary each time because I find that it depends on the weather and how I cut the shortening into the flour. If it’s humid, I use less water because the air is sort of helping me already. If I didn’t cut it the shortening into the flour quite enough then I need to add more water to absorb the excess dry ingredients. Chill. Chill the dough for at least 30 minutes. Chilling the dough helps to keep the fat solid so that the pressure from rolling out the crust can’t melt it. It also gives the moisture time to soak into the flour. I form the dough into a ball and cover it in plastic wrap tightly. Rolling. Lightly flour your work surface. 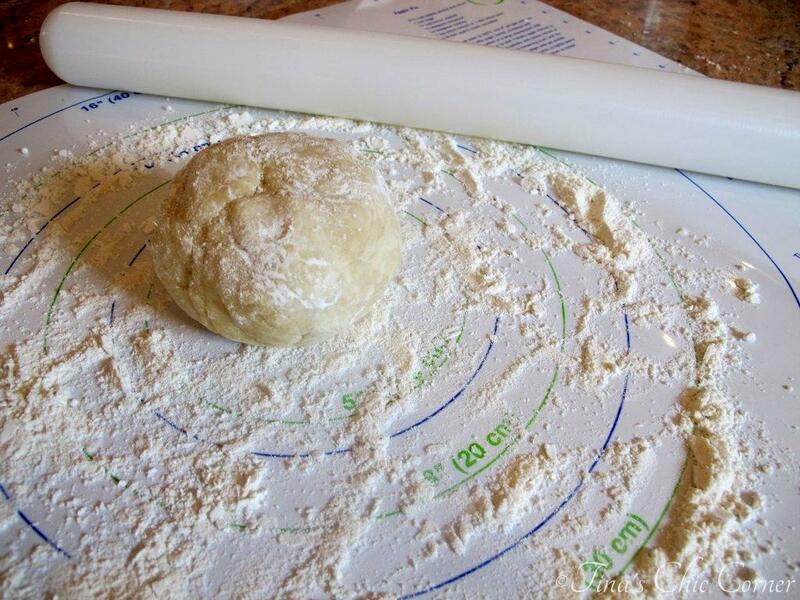 Roll the dough from the center and work your way out, rotating it after every stroke. Apply even pressure when you roll in order to make sure the center isn’t thicker than the outer edges. If the dough is sticking to your surface or the rolling pin add a little more flour to whatever is sticking and keep rolling. Do not over work the dough. Definitely do not take dough that has already been rolled out and ball it up again to start over. That’s the surest way to overwork the dough and it will likely create a tough crust that isn’t flaky. It’s okay if the dough tears during rolling or when placing it in the pan, simply pinch it back together. Placement and Bake Time. Carefully lift the dough off from the surface. I use a spatula to help get it started if it’s a bit sticky. 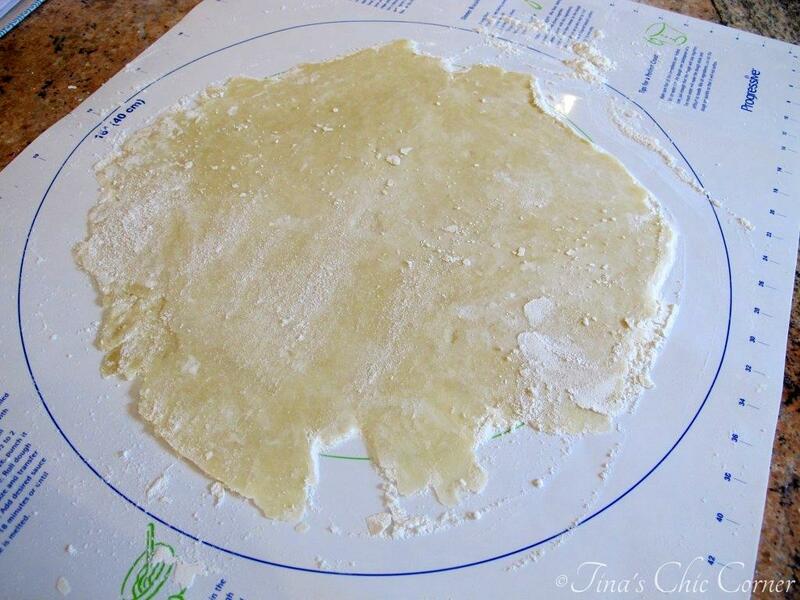 Then I very loosely roll it around the rolling pin to transfer it easily into the pie plate. Gently lay the dough into the pie plate and gently press the dough into the edges and corners of it. 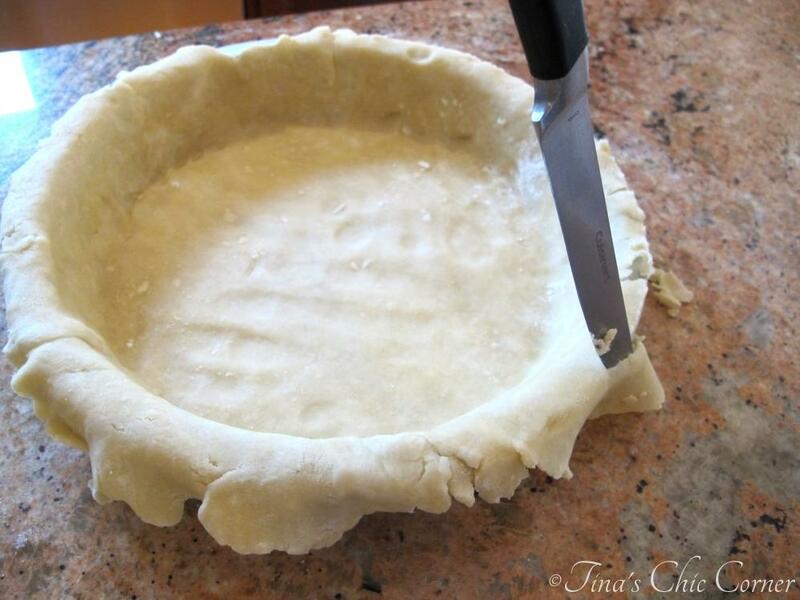 Cut any excess dough that hangs over the pie edges. Use the excess dough to patch up any areas that seem to be short. It’s not always the prettiest looking at this point, but once it’s filled and baked it will sure taste good! 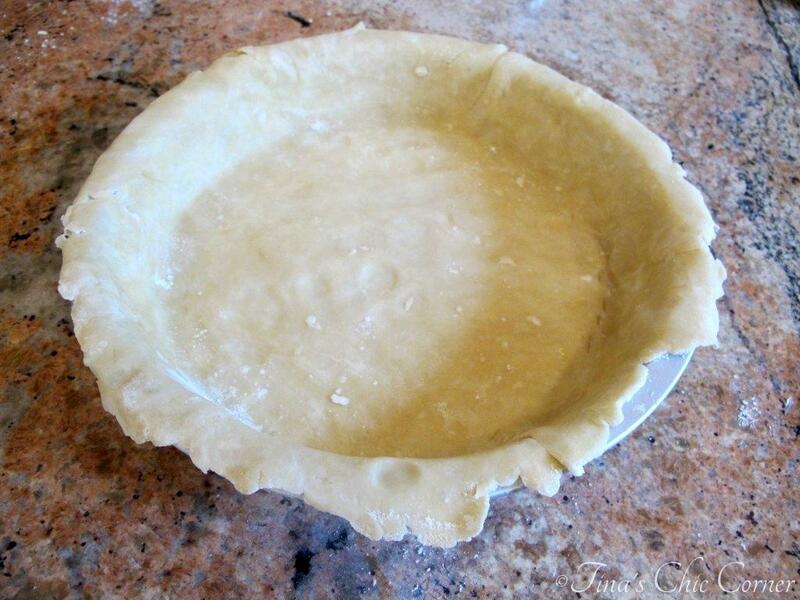 Fill the crust with the desired filling and bake according to the directions of your pie recipe. This pie crust is so versatile. I’ve used it for peach, blueberry, and apple pies, and even chicken pot pie! Note: Not a paid advertisement for Williams-Sonoma. I’m just sharing my opinion. I have never tried using shortening for the pastry but now maybe I will. I use an all butter recipe for my tarts/pie crusts which has worked out fine for me,so far. Family recipes are always special and they never fail. Thanks for sharing! I’ve made pie crust once, I think, and it wasn’t as bad as I thought it was going to be, albeit, very messy! Your recipe is so easy to follow and I really appreciate the step by step pics. I really want some peach pie right now!